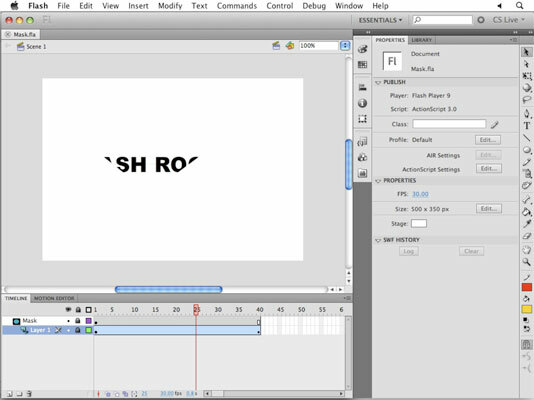 Masking in Adobe Flash Creative Suite 5 involves using a shape (or shapes) to hide or reveal portions of a piece of Flash CS5 artwork — much like viewing the outside through a small window in your house. The window’s size limits what you can see when you’re inside. If you’ve worked with layer and selection masks in other Adobe applications such as Photoshop and Illustrator, the concept of masks should already be familiar to you. The technique for creating masks in Flash is a bit different, but the core concepts of masking are the same. For this example, we typed FLASH ROCKS in capital letters. In the Convert to Symbol dialog box, choose Graphic from the Type drop-down list and enter a name for the symbol in the Name text box. To create a new tween span, right-click (Windows) or Control-click (Mac) the layer that contains your text and choose Create Motion Tween from the con-textual menu that appears. For example, we used the Polystar tool to create a star in the center of the stage. The Star option for the Polystar tool is available in the Property inspector, under Options.